American pika, a rabbit relative native to the Rockies. (CN) – A cute, furry critter from the Rocky Mountains may be more resilient to the ravages of climate change than previously thought, according to a study released Tuesday. The American pika, a cousin of the rabbit, has thriving populations both in areas that are wetter and colder, and warmer and drier, than scientific records had previously indicated, according to a study published by biologists working for the U.S. Forest Service. In the past, scientists explored areas of the Great Basin where pikas flourished historically. When they found those places largely pika-free, they began to conclude the little animal was on the precipice of extinction. 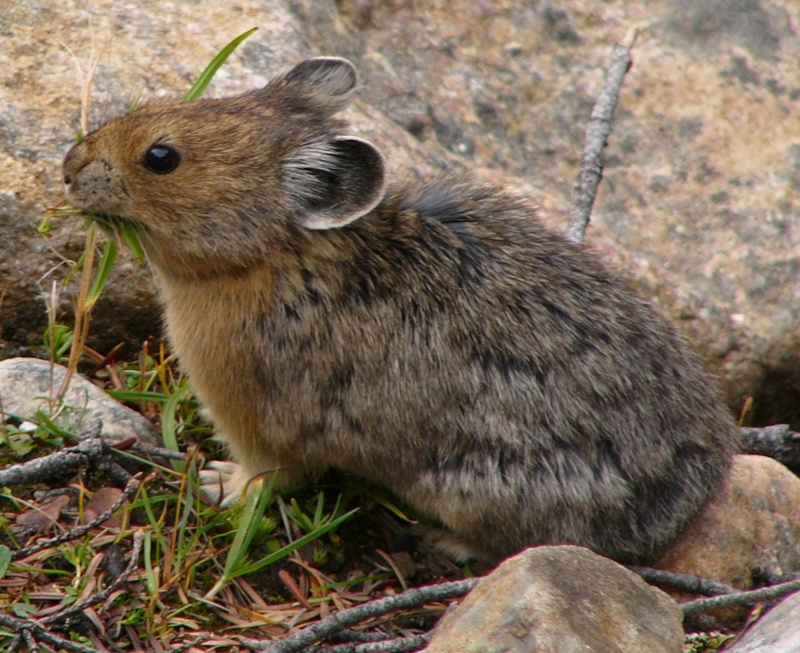 But the study, called “Distribution, climatic relationships, and status of American pikas in the Great Basin, USA,” published in Arctic, Antarctic, and Alpine Research, found that previous research regarding pika population distribution focused too heavily on those historic sites, ignoring new areas to which the animals might travel. Millar says a more thorough analysis reveals the pika can subsist in a wide variety of environmental ecosystems, meaning its adaptive abilities are more robust than previously believed. Millar and her colleagues gathered 2,387 records of occupied pika sites, 89 records of previously occupied sites that were later found vacant, and 774 records of sites that contain older signs of occupancy, but at which extirpation could not be confirmed. Extirpation describes an environmental process by which a species becomes extinct in a certain area. Pikas were found at elevations ranging from 5,350 feet to above 13,000 feet, and traversing 40 mountain ranges across California, Oregon, Nevada and Utah. Researchers could not find a common strain that would indicate climatic changes were the culprit in the ecosystems the pikas abandoned. For instance, many places they found pikas thriving were climatically similar to what their historic habitats had recently become. Researchers say eliminating climate change as the overwhelming factor can help scientists focus on more likely explanations for the abandonment of the pika’s historic habitats.